The ponytail palm is the ideal houseplant for the winter as it needs very little humidity and water in warm, dry indoor air. Although often mistaken for a palm; however, it is a succulent closely related to the yucca which is an Agave family member. It is so named because it has long, slender leaves that look like strands of hair growing from its trunk. The leaves are very tough and its thick bulbous trunk which stores water looks like an elephant's foot. This is why the tree is also called the elephant-foot tree and the bottle palm. 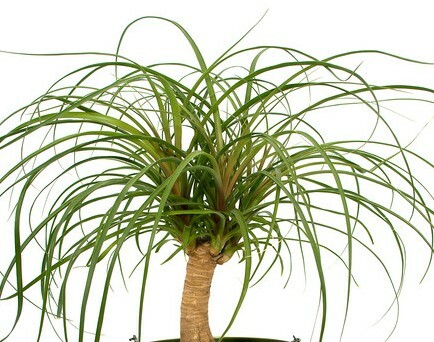 Beaucarnea recurvata (aka Nolina recurvata) is the botanical name for this unusual plant. It is a slow growing ornamental that can serve as the perfect accent bonsai tree because it likes to be kept pot-bound and grows to 4 feet tall indoors. The elephant-foot tree originated in the deserts of Mexico and developed its own water storing facility to endure long droughts. Because of its ability to store water for longs periods of time makes it an easy care plant -- perfect for the forgetful gardener. It is very forgiving and does a very good job at maintaining itself especially if you are on vacation or away a lot. In addition, it thrives indoors with bright light as well as tolerates low light conditions and cool temperatures. For decorative purposes, this unusual fountain-shaped plant with its delicate-looking leaves flowing over like water would look great placed on a pedestal or in a corner. In fact, this stunning plant would make a spectacular display in any room. Watering: Water thoroughly when the soil is dry at least one inch down, then all excess water to drain and discard. This watering can last for weeks but If the plants lower leaves become yellow or start to turn brown, it’s a good sign that the plant isn’t receiving enough water. Humidity: Average room humidity is sufficient. Light: Place in high light area near a sunny south, east, or west window. Temperature: Plants prefer warm 60 to 85 degrees Fahrenheit but can tolerate lower temperture. Soil. Grow in Cactus potting mix or use a good quality potting soil mixed with half sand for drainage to prevent root rot. Fertilize: This slow-grower needs to be once a month during the spring and summer growing season. Use a basic houseplant food at 1/2 the recommended strength. Re-potting: Keep slightly root bound and repot about every 3 or 4 years. Always pot that is only one size or two larger. Pests: Check for spider mites, scale, and mealybugs. If you find any, spray with soapy water or an insecticide. Grooming: Wipe down leaves with a damp cloth to remove dust. This also helps to remove mites. keep your ponytail palm in a sturdy pot with good drainage as it grows bigger and be careful not to overwater because it's a killer.